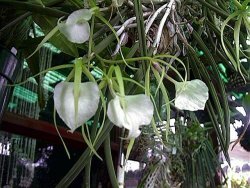 Native Origin Brassavola nodosa is an epiphyte native to Mexico, Central America, Brazil, Bolivia and Peru. It is a member of the genus Brassavola, which has 17 species and is named for A.M. Brassavola (1500 to 1555), a Venetian botanist. Light Provide a well lit exposure in a greenhouse or on a windowsill, similar to that given cattleyas and laelias. Under lights, place the plants 8 to 10 inches from the tubes that burn 14 to 16 hours a day. Temperature Brassavola nodosa is tolerant of a wide temperature range, benefiting from intermediate to warm conditions (65 to 80 F during the day with a 10 F drop at night). Water Water regularly, allowing the medium to dry slightly between waterings. Fertilizer Apply a balanced fertilizer once a month, diluting to the recommended strength, or a weaker solution more frequently. Potting Grow this epiphyte in a clay or plastic container, a wood-slat basket or a tree-fern basket. Choose a porous medium through which water drains rapidly, such as fir bark or tree fern. Another method is to attach the plant with monofilament or a glue gun to a piece of driftwood or cork, or wire it to a tree-fern plaque or ball. Pests Brassavola nodosa is a sturdy orchid that remains healthy when grown in a clean environment. Inspect periodically for insects and take appropriate action when necessary. -- AOS Staff. for the use of the above picture.